Five years ago, I described how Google was distancing itself from Android and increasingly pursuing a new strategy around Chrome OS. While that was a controversial idea at the time, Google’s latest announcements show that’s exactly what the company had been doing. Just as Android began taking off among phone hardware makers who were desperate to make something that could compete against iPhones, Google introduced an entirely new operating system: 2009's Chrome OS, initially aimed at netbooks. Google expected hardware makers to produce the first mini-notebooks running Chrome OS by the middle of 2010-- in parallel with its phone-centric Android 2.0, which had just been released at the end of 2009. However, Google's dual OS strategy (not unlike Apple's Mac and iOS, or Microsoft's desktop Windows and Windows Mobile 6.x of the same period) didn't exactly work out as expected. The late 2000's netbook demand that Google planned to capitalize on with Chrome OS was wiped out by iPad in 2010. Additionally, hardware makers weren't even ready to build Chrome OS netbooks until the middle of 2011. 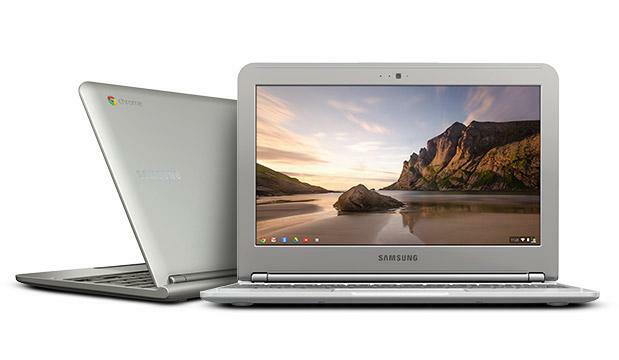 Chromebook partners like Samsung delivered their first models just as nobody cared about netbooks anymore. Both Honeycomb tablets and Chrome OS netbooks flopped out of the gate. But that wasn’t the only problem for Google’s Android and Chrome OS. Both had also stirred up contention with Apple, which increasingly saw Google as an assailant rather than a partner. Animosity continued to increase between Apple and Google. The pair had previously worked together to bring Google's powerful search and mapping services to iPhone using Apple's user-friendly apps and development platform. But after Google mocked Apple at the release of Android 2.0, Apple stopped integrating new features of Google Maps in iOS, including its Google Latitude location tracking and the Google Maps+Navigation services that debuted with Android 2.0 in late 2009. Jobs had also announced in 2009 that Google's chairman Eric Schmidt would be stepping down from Apple's board, specifically because of Google entry into "more of Apple's core businesses, with Android and now Chrome OS." Google's Android 3.0 Honeycomb tablets were more like PC tablets than Apple's iPad. As these failed, Google repositioned Android as a way to power a series of low-end 7-inch tablets, notably Google’s self-branded 2012-2013 Nexus 7 with an astonishingly low price of just $199. Following cheap tablets, fancy Android phones were giving way to commodity devices with collapsing prices delivering scant profits. The ideas that Android partners would steamroll iOS and that they could advance innovation faster than Apple were becoming increasingly difficult to believe. By early 2013, Android’s lackluster performance under the management of Andy Rubin resulted in Rubin being sidelined in "new projects" while the Android division was handed to Sundar Pichai, the head of Chrome OS development. By 2014 Rubin was out of Google entirely. Under Pichai, Google launched Chromecast in 2013 as a way to challenge Apple’s popular AirPlay for wirelessly beaming audio and video from iOS devices to an Apple TV. Yet Chromecast wasn’t based on Android. Instead, it used software developed for Chrome OS. Pichai also turned the script on Google’s "cheap hardware," terminating its low-end tablets and launching the Chromebook Pixel, an expensive Chrome OS netbook priced at $1300 to $1450, taking aim at Apple’s popular MacBook Air rather than its lower-priced iPads. Chromebook Pixel was neither cheap nor Android nor successful. 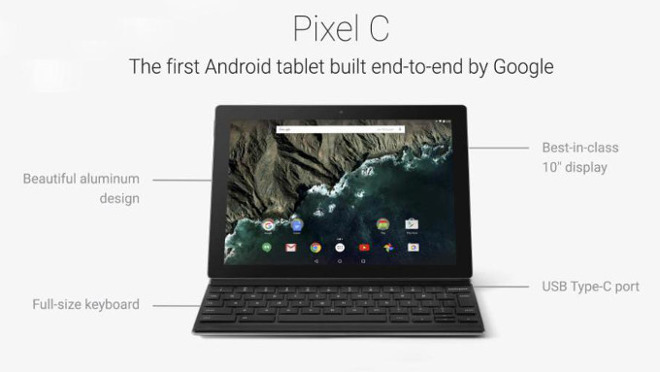 Pichai also clearly saw Chrome OS as the future of Google's hardware licensing. "We're pushing computing forward," Pichai stated at the time. "It'll definitely make the ecosystem rethink touch. I think people will take the first step toward building tablets with this." That didn't happen. Chrome OS remained unpopular and Pixel sales never took off. The next year, Google floated another Android tablet, the Nexus 9 (ironically code-named "flounder"). It was designed to look just like Apple's then wildly popular iPad mini, which had been driving iPad sales into the stratosphere. It also carried a higher price, from $400 to $480, much higher than previous Android tablets from Google and its partners. But its Apple-like price didn't result in Apple-like sales. Pixel C was Google's last Android tablet. Last year, Google discontinued its Android tablets. Last week, Google introduced three new devices: Pixel 3 phones, a Home Hub "smart display," and a new Chrome OS Pixel Slate tablet. While it's notable that Google is again trying out Chrome OS instead of Android on its latest tablet, the company also raised eyebrows by dumping Android from its stationary "hub" tablet product. 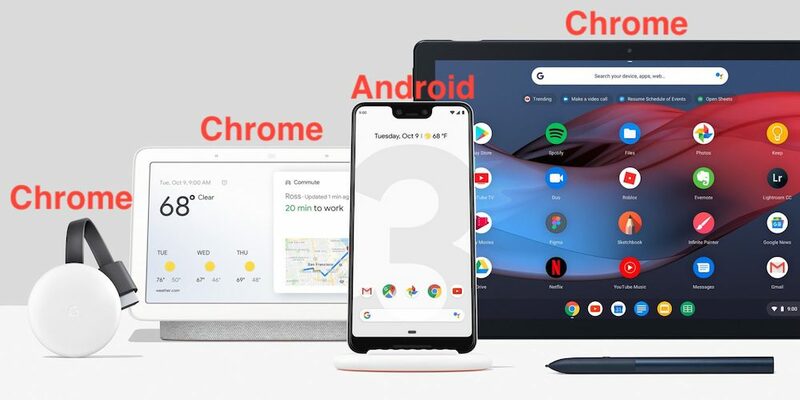 Of the four device categories, Google now sells, only one is still based on Android (Pixel phones), while its tablet, TV, and screen products have all moved on. If Chrome OS could run a phone, Google would likely have made that shift too, but the reality is that it took Google five years to wean itself off Android in tablets. Three years after it introduced "Android Things," it's now weaned itself off of that, too. It sure looks like its a combination of Android's flawed design (being an interpreted Java implementation rather than running native code, a factor that makes it far less efficient than iOS); the continuing problem of Oracle's intellectual property lawsuits involving Android's appropriation of Sun's Java code; and Pichai's natural affection for his own Chrome OS work rather than Rubin's Android. Android defenders can insist that Oracle has no legal rights to Android, or that its IP lawsuit has no merit, but the reality is that the case hasn't been thrown out and instead keeps getting stronger for Oracle, threatening to involve billions of damages against Google-- and/or the threat of inserting new regulation or scrutiny into how Google can use Android, a far more devastating prospect than simply paying a fine. Since I first published the idea that Google was distancing itself from Android, contrarians have insisted that this idea was preposterous. But here we are a few years later and Google is using non-Android software everywhere it possibly can: Chromecast, tablets, and screens, despite having Android code it could be using instead—and years after delivering Android Things as a solution it expected third parties to use. 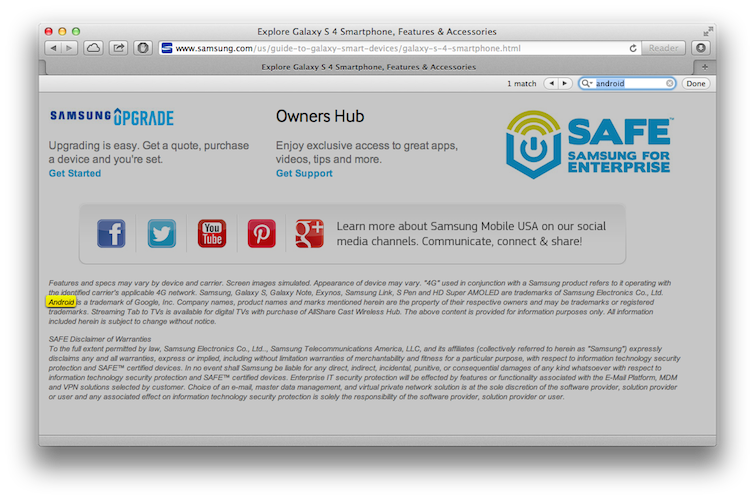 Samsung's Galaxy S4 web page made one mention of Android in tiny type. This year, even Google itself appeared to go out of its way to avoid saying the A-word. Writing for 9to5Google, Stephen Hall noted that "'Android' wasn't said a single time during the Made by Google 2018 keynote. It marks the first time ever that Google has held a public-facing hardware event like this-- since the introduction of the operating system in 2008-- without at least mentioning it by name." He also noted that Google has stripped the A-word off of much of its app branding. Android Pay and Android Messages are now Google Pay and simply Messages. If Android is such a great brand and is "popular" among buyers globally, why are licensees and even Google itself avoiding any mention of it? The answers appear to be right in line with what we predicted five years ago: Android lingers under the issue of stolen IP, and its core foundation as a platform is not only flawed but fails to mesh which Google’s own core competencies and the focus of its management. Google has always been a web services company, building web clients with web tools. It was only with the 2005 acquisition of Rubin’s Android project that it got into the business of maintaining a non-web platform. Android simply hasn’t worked out well. Google has invested tremendously into the platform but as years go by it hasn’t been able to attract the kind of premium users that iOS has. The main thing that Android has accomplished is to fill up space that has prevented other potential competitors from taking root. When Microsoft tried to launch Windows Phone in 2010 to leverage its PC partners in taking on Apple’s iPhone, it was stymied by the free availability of Android. When Samsung similarly tried to get Bada off the ground in 2010, and then Tizen in 2012, it was hampered by Android’s lock on smartphone apps and mindshare. Note that Samsung has shifted its own smartwatches and Smart TVs to Tizen, making it clear that it wants off Android as much as Google does. Blackberry invested significantly in the development of Blackberry OS X, hoping that the new platform would power tablets, phones and other mobile devices. In a world increasingly dominated by Android, it didn’t have a chance to get off the ground. It gave up and adopted Android and has sunk into oblivion ever since. Sailfish, Nokia’s MeeGo/Maemo/Moblin, Ubuntu Touch and other open source mobile platforms have also been unable to germinate and develop under the suffocating blanket of Android. On the other hand, having the entire consumer electronics world largely aligned under Android—handcuffed by its problems and unable to rapidly and radically innovate—has been great for Apple. It means that rather than competing against Microsoft or a radical new innovator it only has to keep ahead of a mobile platform that has never been directly profitable for its developers, and is hampered by its own legacy and fragmentation.